Ok, I have to come clean. I don’t always post my finds.Not because I don’t have time, although often that is the case. It’s just that I don’t deem the finds worthy of a post. After you post the same finds over and over you start wanting to make your posts memorable. If I was finding silver coins every day or gold rings or really cool relics, I wouldn’t be like this. But as it happens, my usual finds are always the same; bullets, clad, crap. YAAAAWN…. 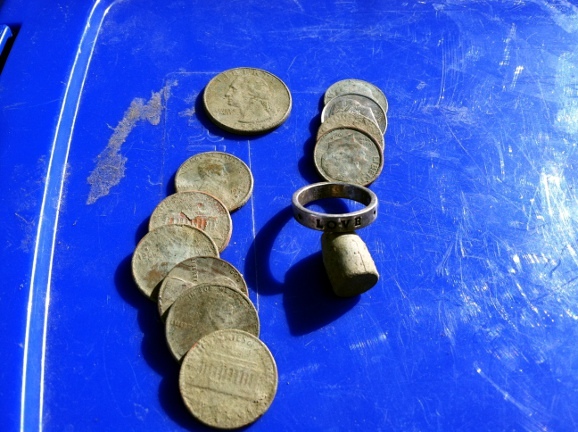 Somehow, silver rings got in the category of boring finds in my mind. So I haven’t been posting the silver rings I’ve been finding. Just in the last 3 weeks or so, I’ve found three silver rings that I haven’t even been telling my friends about. I will remedy this however. I need to get out of that mind set and return to the days when everything and anything I found was exciting. So here’s a picture of a silver ring I found at lunch the other day, along with the clad and, yep, a bullet. I hadn’t yet deleted this picture from my phone. I did tell Steveouke about this one though. So I hope I continue to find silver rings to tell you about. I won’t often write about clad coins but finding a dollar coin is rare enough to warrant a post. 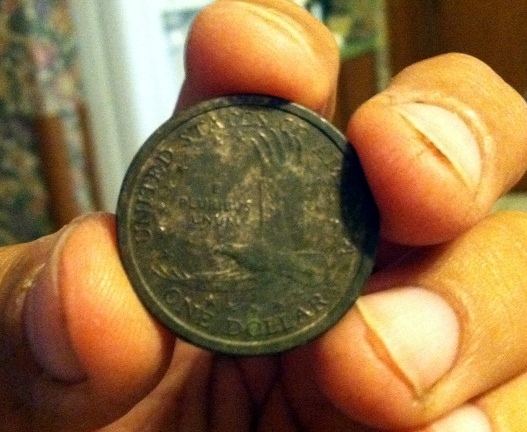 I went back to Linwood park in hopes of finding a cool old coin. On the way, I checked a voice mail that another hunter left for me. He told me that he heard a woman lost her gold ring in this park and he told me the general area where to look. 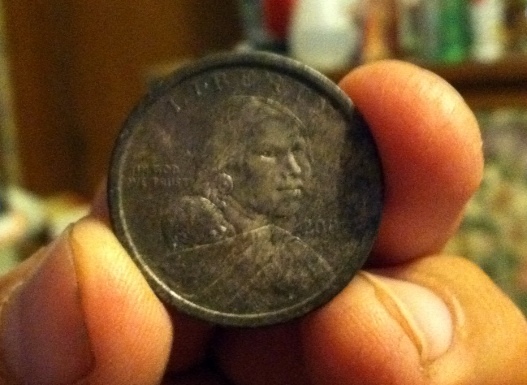 I looked for 3 hours and all I got were some clad coins which included the 2000 Sacajawea dollar. I suspect this large old park may hold old dollar coins as well, all I have to do is swing my coil over them.